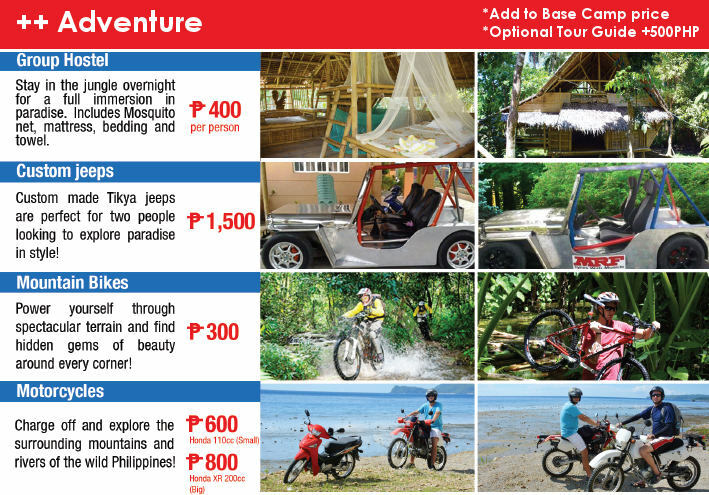 Get Off Boracay with Mainland Adventures! For in-the-know travelers and adventure seekers, the Malay mainland off-Boracay has long represented a small speck on the radar of possible destinations. Recognition from the Philippine’s Department of Tourism and other organizations has helped that speck to beat more intensely over the years. Most people still know little, if anything, about these off-the-beaten-track destinations. And yet it is hard to imagine a place in the Philippines better suited for nature lovers, fans of adventure sports, or anyone looking for a beacon of sustainability.As if that wasn’t enticing enough, there is a new reason to visit this self-sufficient province – Main Land Adventures Base Camp: an all-day nature trip that takes you outside of the popular four-kilometer White Beach on Boracay island and sets you up for an unforgettable wildlife adventure. This all day adventure starts with pickup at 10:00am from D’mall. You will proceed to the mainland where you will acclimatize and get ready for the rest of the adventure. The first stop is a relaxing walk through a local Eco Park, where you can catch some sweeping views of Boracay and take in the butterfly filled gardens. Your next stop just might be home for the day. At the Nabaoy River a delicious jungle lunch barbequed just right, has been prepared for your arrival. The lunch is enjoyed in the garden & river area, surrounded by towering palm trees that protect the serenity of the area. Natural vegetation and traditional hand-crafted bamboo structures provide the good vibes to get this day started in earnest.Some guests fall in love with the area and choose to soak up the day here; enjoying a few of the inclusions. At Php 1,900 per person, you’ll get round-trip transportation, a mouthwatering barbeque spread, inclusive of fresh coconuts served in the gardens of Nabaoy River, traditional coconut wine known as tuba, and riverside lounging by a nice bonfire. Base Camp can be your home for a day, a night, or the start of many new adventures on the mainland! Add on Activities + Adventure + More! We’ve crawled through the entire mainland in search of the most exciting Off-Boracay offerings. While the initial base camp package is awesome as a stand-alone, you can add any of these extras to your mainland adventure and really amp up your day away from Boracay. 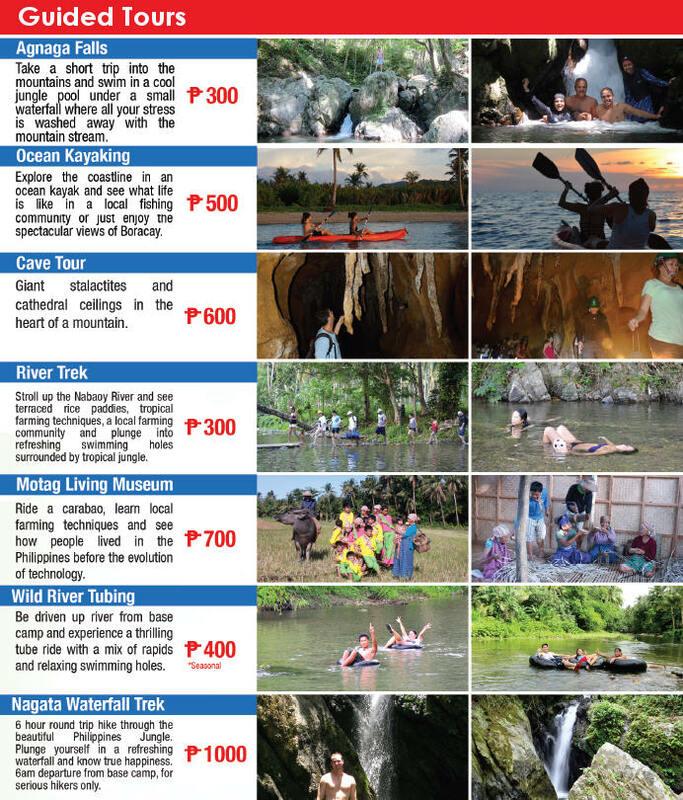 For just 500 PHP you can add a tour guide if you would like to take a local expert along for your adventuring. 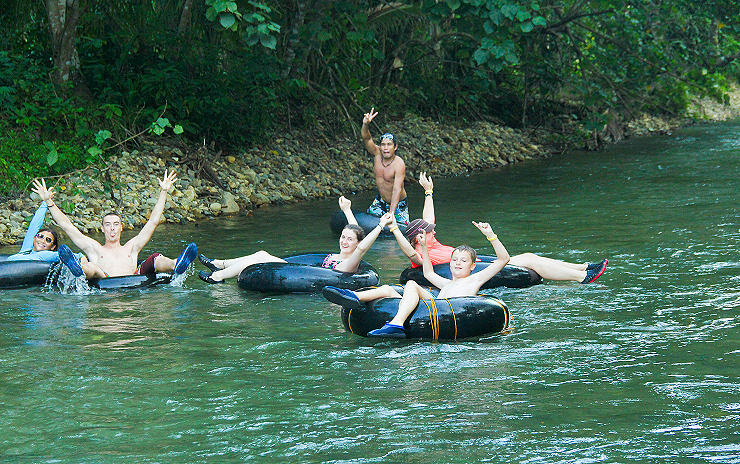 The most popular items are the Custom Jeep adventure and the Group Hostel overnight stay in the jungle. 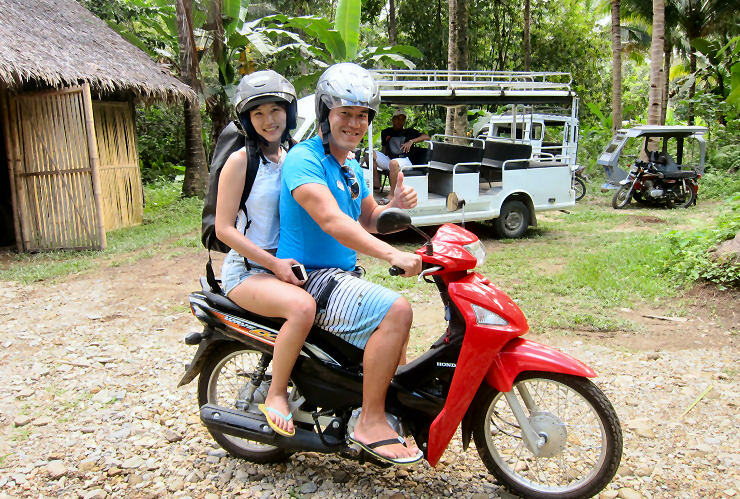 Motorcycle, and mountain bikes are available for rent for those who wish to explore the attractions of the neighboring towns of Nabaoy, Nabas and Buruanga. Following all of this, a relaxing massage right next to the river is available for the guests to help unwind and recharge for the next day. 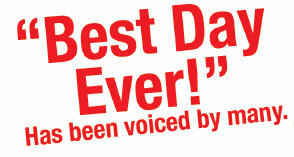 Guided tours for the more experienced nature junkies can be added to the packages as well. Ocean kayaking where you can explore the coastline and head on to small fishing villages as you take in the magnificent view of Boracay Island, river trekking where you can see rice paddies and observe local farming techniques in a small farming community surrounded by a tropical jungle, cave tours in which you are taken to the heart of the mountain and bask in the beauty of the giant stalactites and cathedral ceilings, experience a thrilling tube ride with a mix of rapids and swimming holes with wild river tubing and finally, a 6hour roundtrip hike through the jungle in the Nagata Waterfall Trek wherein you can plunge yourself in the rejuvenating falls after a steep and heart pumping climb. The Motag Living Museum is right around the corner from Base Camp as well. 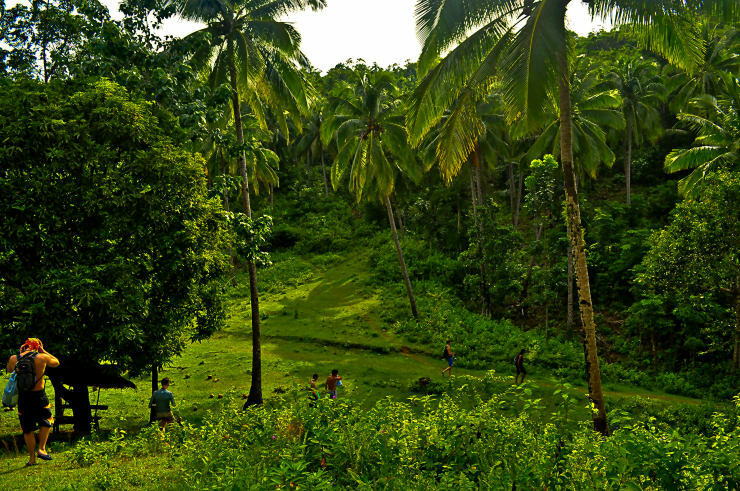 Here you can experience what life was like in the Philippines before the evolution of technology. Ride a carabao, learn local farming techniques and learn about sustainability while appreciating the simplicity and beauty of life back then. If you’re feeling the urge for a high-adrenaline outing or an exciting new destination, then the Mainland Adventures Base Camp is sure to deliver the perfect adventure holiday fitted for you. You can easily customize and plan depending on the length and kind of vacation you are looking for. A huge range of adventure tours are available right at your feet. if you have any additional inquiries please feel free to comment below, call or email. One of our staff will be along shortly to help out. See you soon & all the best from the team at Off Boracay Mainland Adventures!! This entry was posted on 星期二, 二月 7th, 2017	at 5:50 下午	and is filed under guides-zh-tw, Populars, 最近	. You can follow any responses to this entry through the RSS 2.0	feed. You can skip to the end and leave a response. Pinging is currently not allowed.